I was intrigued by a link sent to me via Twitter at Sharp Football Analysis, a handicapping site. The article demonstrated that NE's ball security was an outlier to the tune of several standard deviations. The charts are convincing, and the implication is that NE benefitted from under-inflated balls is unmistakable. But I wasn't sure how much stock to put in the numbers for a couple reasons. One is that they were so extraordinary they seemed unlikely to be true. 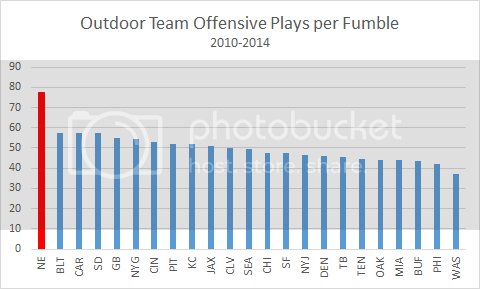 And second, the analysis used plays per fumble as its basis rather than fumbles per play. For low-rate events, like fumbles, outlier cases can appear exaggerated depending on which way you look at them. NE ranks third over that period. Very good, but nothing out of the ordinary. 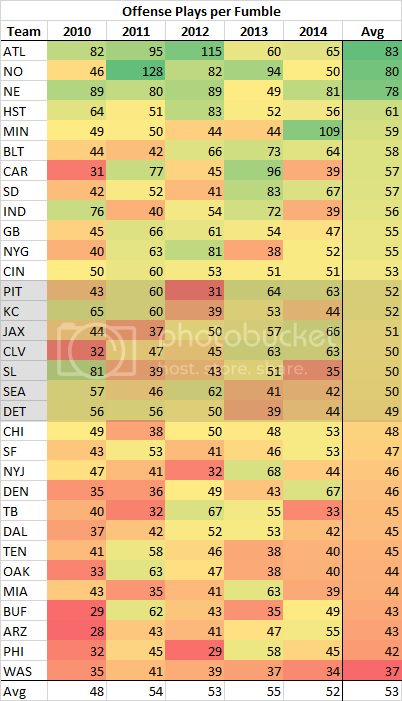 You'd expect teams with good QBs and good offenses to have fewer strip-sacks. But the article linked above makes a good point: Many teams that play indoors are concentrated at the top of the list. Let's see how the table looks if we exclude dome teams. You might notice that 2013 was a bit of a down year for NE ball security. That's partly due to the week 12 game against DEN in insanely frigid conditions. NE had 6 fumbles and Denver had 5. Extremely cold temperatures are associated with high fumble rates--They're about 35% more frequent than usual in the coldest games. But if we threw out that game, NE would have a 60 play-per-fumble rate. Not the best that season, but still better than any other outdoor team's 5-year average. 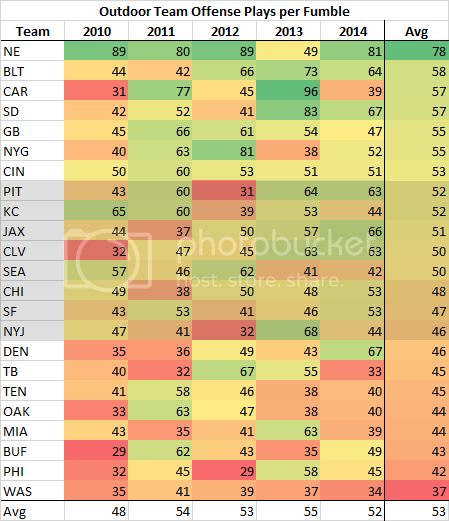 To get a better sense of just how NE stands out apart from the crowd, here are the team averages in chart form. As I mentioned, sometimes outliers can be exaggerated depending on which way you look at a rate. 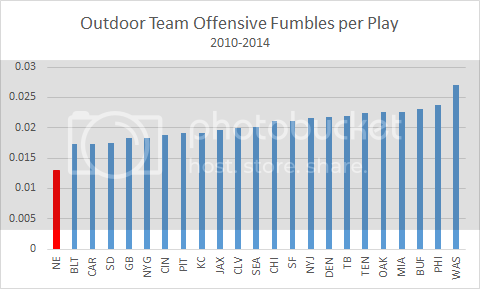 Should we look at fumbles per play or plays per fumble? Mathematically, both measures contain the same information. I prefer fumbles per play, because I conceive of each play having an independent probability of fumble, and fumbles per play is an unbiased estimator of that probability. So this is what it looks like from the other direction. Not much difference. I'm not sticking my neck out here and saying this is evidence of anything. It's fair to say that Belichick emphasizes ball security emphatically, and is quick to bench players who drop the ball. Everyone will have their own opinion anyway. I'll just say, either way, it's worth looking at. If it's a result of an unfair advantage, that's interesting. If it's the result of good coaching, that's just as interesting. One last note. Hey WAS! What the hell? 37 plays between fumbles? 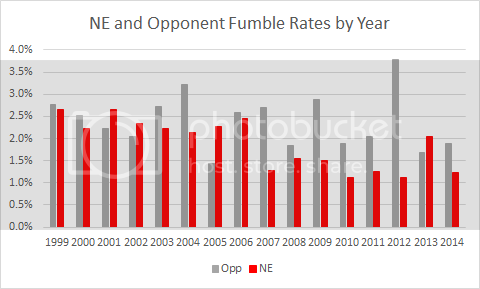 Addendum: @yonghang suggested a comparison of NE and opponent fumble rates. This would hold for environment. In other words, climate, indoors, outdoors, etc. would not skew the results. 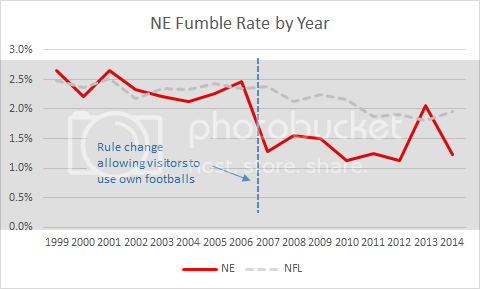 Addendum 2: @brian30tw pointed out that NE's big improvement in fumble rate occurred in '07, precisely when the NFL's rule allowing visiting teams to bring their own balls went into effect. Other teams didn't have such good fortune.